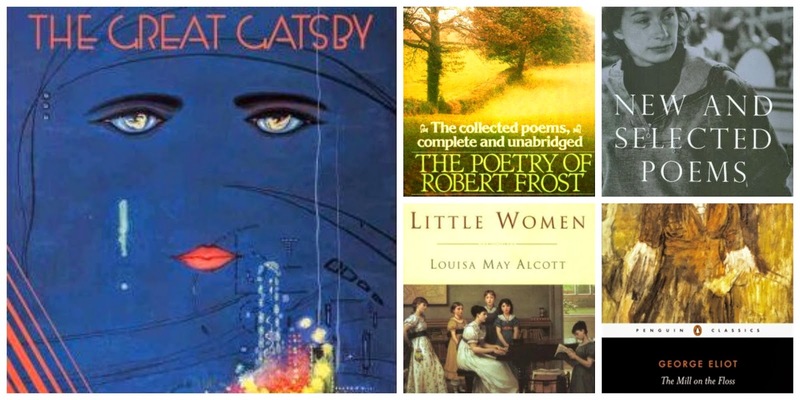 This week Top Ten Tuesday is all about classic literature and I chose to focus on which classics I would love to reread. 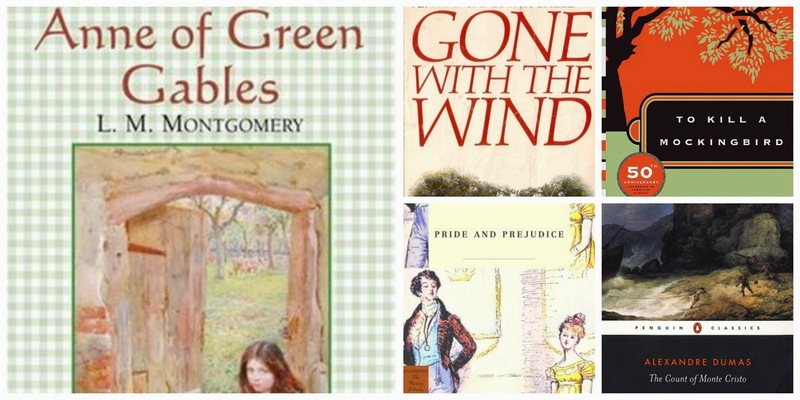 This is a fun topic for me as I was an English major in college and love classic literature. It was tough to narrow it to ten, but let me know what you think! (Sshhh…I cheated a bit and added some volumes of poetry I'd love to reread!). 1. Anne of Green Gables by L.M. Montgomery - I was obsessed with this series as a kid and would love to revisit it. I even bought a brand new hardback copy for my "favorites" book shelf! 2. Gone with the Wind by Margaret Mitchell - I read this book in middle school and then reread it a few years later. I absolutely love it and I think I am due for a re-read soon! 3. To Kill a Mockingbird by Harper Lee - I have reread this multiple times and it never gets old. 4. Pride and Prejudice by Jane Austen - Mr. Darcy. Need I say more? 5. The Count of Monte Cristo by Alexandre Dumas - I love this story of revenge, love and adventure. 6. The Great Gatsby by F. Scott Fitzgerald - For the most part, I loved the latest version of Gatbsy with DiCaprio. It has inspired me to reread this book. 7. The Poetry of Robert Frost by Robert Frost - I could always use more Frost in my life. I love his poetry. 8. New and Selected Poems by Mary Oliver - I also love her poetry and have a copy of it on my coffee table now. She never gets old. 9. Little Women by Louisa May Alcott - I haven't read this book since high school and would love to reread it with "older" eyes. 10. The Mill on the Floss by George Eliot - I remember being so impressed by this book in college. It was one of those situations where I thought I would hate it, but I ended up loving it. It definitely deserves a reread. What classics do you want to reread? Which ones are your favorite classics? Let me know! This meme is hosted by The Broke and the Bookish, so check it out! A huge yes to Pride and Prejudice an To Kill a Mockingbird Christina! Those are two I really loved and that didn't feel like homework when I had to read them in school. I've only seen the movie version of The Count of Monte Cristo, but I loved it and would like to try the book one day:) Thanks for sharing these! Me too. I love them! You must read Monte Cristo--the book is even better than the movie. (duh) haha. Thanks for visiting, Jenny! Gone With the Wind, To Kill a Mockingbird and Little Women are some of my all time favorites! Great list! Thanks, Christianna and thanks for stopping by! I am in love with To Kill A Mockingbird and The Great Gatsby. Wonderful list of books! Thanks, Emma, and thanks for dropping by! The only one I have read is To Kill A Mockingbird. So many others on your list that I want to read someday. I hope you get to read some of the other soon…they are all fabulous! Thanks for visiting, Stephanie! Me too, Melissa! Thanks for visiting! I have read most of the books on your list which kind of surprised me because I always feel deficient in reading the classics. Some of my favorites include Pride and Prejudice, Persuasion, Jane Eyre, Les Miserables, and Little Women. I actually have never read Les Mis, which is crazy, because it's one of my favorite musicals. I should probably check it out sometime! Thanks for visiting, Christina! I have only read Count of Monte Cristo in your list and that was a long time ago and I mostly forgot the story. I'd like to rereade that book too! Sorry it took me so long to reply, but I was on vacation last week. Great list!! I loved Gatsby as well. I read several of the others you listed back in high school, but it has been so long that I really don't remember them. It is probably time for a reread. Thanks for stopping by my TTT last week! !